Takahata at Studio Ghibli’s office on February 12, 2015. 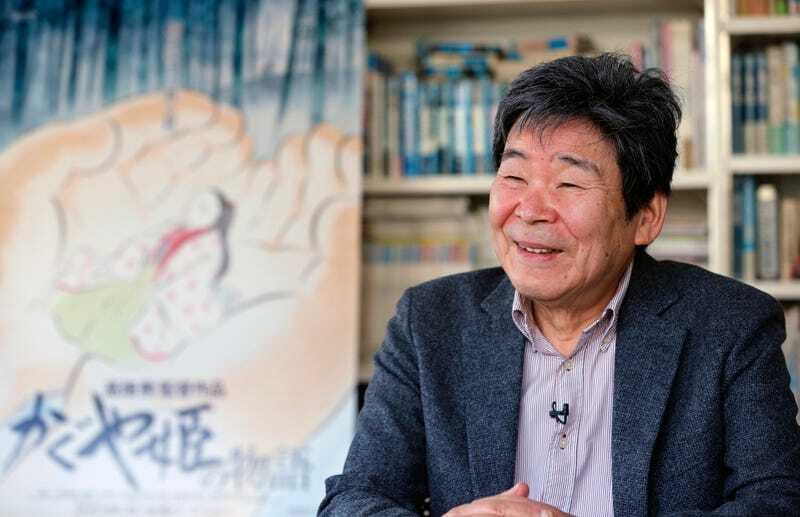 Takahata’s distinguished career as a producer, director, and animator began in 1959 when he joined Toei Animation as an assistant. There, he met his longtime collaborator and fellow animation legend Hayao Miyazaki, with whom he later founded Studio Ghibli along with Toshio Suzuki. A number of Studio Ghibli’s most famous anime have benefited from Takahata’s hand as a producer, director or writer. After producing 1984's Nausicaa of the Valley of the Wind and 1986's Castle in the Sky, Takahata directed Grave of the Fireflies, a brilliant and devastating World War II drama that received universal acclaim. Between 1991 and 2013, Takahata directed Only Yesterday, Pom Poko, My Neighbors the Yamadas, and The Tale of Princess Kaguya, the latter of which was nominated for an Academy Award. He continued working through 2016. Reportedly, Takahata’s health began declining last year because of a heart condition.